Or at least, that is essentially the only excuse applied by the transport authorities of the UK and Ireland in the use of discount travel cards to recoup some of the losses incurred by students availing of discounted services. 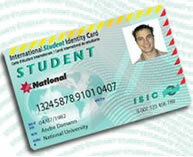 In Ireland, despite the much reduced number of higher education establishments, the lack of any body similar to the UK’s NUS to provide an all-encompassing identification card allows CIE to demand that students buy a €12 student travel card 1Generally at a cost of €15 to the student, to avoid having to take passport photos and post the application form. to avail of their discounted student tickets. That should surely leave UK students in a much stronger position, since the availability of an NUS card and its associated entitlement to numerous other discounts should surely prove sufficient to identify students as being eligible for student prices for public transport services. Surely. But then it would be folly to forget the twisted logic of the islanders – particularly where red tape and money are concerned. As a rule, there simply aren’t any student discounts available. Since there is already a suitable national student card available 2Already at such a cost to the beholder that any hike in price might cause some level of protest from the student bodies., which covers 98% of all UK students, and already includes a flurry of other discounts on goods and services, there would appear little reason to demand an entirely separate card which qualifies the holder for student travel fares. Hence the discounts offered are in the form of Young Persons’ Railcard, and in the case of London’s Student Oyster photocard are limited to certain establishments and cost £5. Whilst this approach to providing a catch-all discount using age as the discriminating factor is perhaps more logical, and can be found across the continent, the relation born to age actually becomes disconnected by the fact that proof of age is no longer proof of eligibility. So how do you identify a student then? Does it have anything to do with them actually being a student, or being able to manifestly prove the fact? Where the discounts are available to young persons, does identification bear any relation to them being under the allotted age, or able to prove it? Not where the transport services are concerned. 1. ↑ Generally at a cost of €15 to the student, to avoid having to take passport photos and post the application form. 2. ↑ Already at such a cost to the beholder that any hike in price might cause some level of protest from the student bodies.